Understanding Homeland Security is a unique textbook on homeland security that blends the latest research from the areas of immigration policy, counterterrorism research, and border security with practical insight from homeland security experts and leaders such as former Secretaries of the Department of Homeland Security, Tom Ridge and Janet Napolitano. A historical overview of the origins of the homeland security enterprise as well as its post 9/11 transformation and burgeoning maturity as a profession. In-depth descriptions of state, local, and federal government entities, such as the U.S. Department of Homeland Security, that enforce and carry out the nation’s homeland security laws and policies. Detailed discussion of relevant, contemporary topics such as asylum and refugee affairs, cybersecurity and hacking, border security, transportation and aviation security, and emergency management policy. 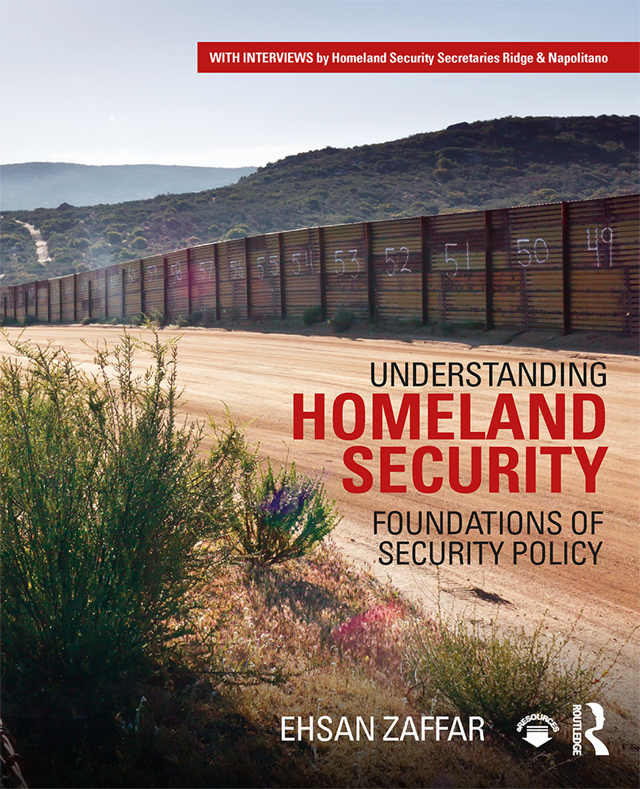 A chapter on homeland security privacy and civil liberties issues. Unique current affairs analysis of controversial topics such as the National Security Agency’s warrantless wiretapping program, Edward Snowden, the 2016 U.S. Presidential Election, Russian cyberhacking efforts, and the Black Lives Matter movement. Advice, guidance, and insight for students through interviews with homeland security leaders as well as terrorism experts such as Bruce Hoffmann and biowarfare specialists such as Dr. Rebecca Katz. The target audience for this text is advanced undergraduate or entry-level graduate students in criminology, intelligence analysis, public policy, public affairs, international affairs or law programs. This textbook meets requirements for entry-level introductory courses in homeland security. "The unaccompanied minor issue is another reflection of the failure of political leadership from both political parties to grasp the national implications of an immigration system that is in need of overhaul"
– From Zaffar’s interview with Tom Ridge, Former Secretary of Homeland Security (2003-05) in Chapters 1 and 2. "…[T]hat is immigration…you have a system that no longer matches reality, our economic needs, nor our moral values." -- From Zaffar’s interview with Janet Napolitano, Former Secretary of Homeland Security (2009-13) in Chapter 4. Ehsan Zaffar is a civil rights lawyer, educator and homeland security policymaker. He primarily studies the impact of homeland security law and policy on civil rights, human rights and civil liberties and has taught courses on these issues at George Mason University and George Washington University.